Wisconsin’s Finest services all channels of the foodservice industry and we offer a complete line of foodservice cheese products. We service Food Distributors, Restaurant Chains, School Districts, Colleges, Universitys as well as Government Agencies. Year after year, we’ve maintained continued success of bringing our customers the best quality cheese at the most competitive prices. Our Foodservice line includes some of the following cheese which can be packed in various sizes and styles. Muenster, Asadero, Grated Parmesan, Cream Cheese, Cheese Sauce. 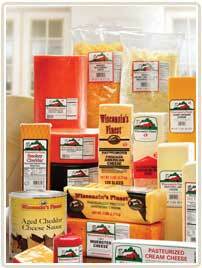 Wisconsin’s Finest is a leader in fine dairy cheese products.